Sunday night, we had a culinary treat when R & L invited us to their home for a traditional Chinese dinner. We had tried their fabulous spring rolls before at an earlier Canadienne Buffet party, so with the anticipation, we lightly picnicked for lunch on the way back from Lyon so that we would have plenty of room for the delights. And we were so glad we saved room! 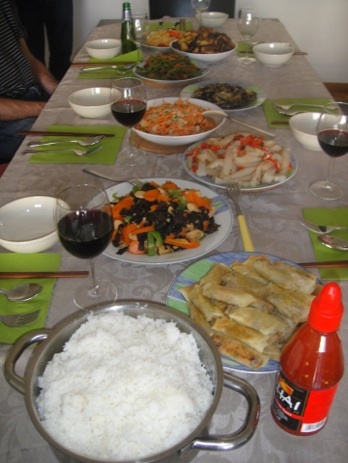 They cooked a magnificent feast for us and we got to try ten different Chinese dishes. They were all A-M-A-Z-I-N-G!! It was so hard to pick what to go back for second bowls of as everything was so unique and tasty. I think we both ended up trying everything twice. All the girls decided we need to teach each other how to cook different dishes that were our “specialties”, so I certainly look forward to my Chinese lesson someday soon. I think Gabe looks forward to me getting this lesson too! Thanks for hosting such a lovely evening, L & R !!! This entry was posted in Canadienne Buffets, Food, Wine & Beer, Life in Geneva, Parties & Fêtes. Bookmark the permalink.